It is recorded that around 1895, Methodists, Anglicans and Presbyterians were separately worshipping in the local Mayfield Primary School. This was the only public building in the district and only suitable space until the Methodist Mission Hall was opened in 1915. 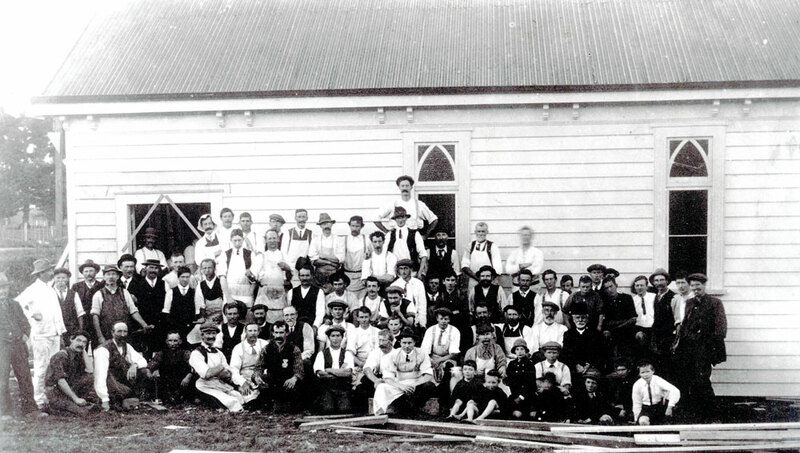 An undenominational Sunday school was also regularly using the school for its activities. In July 1903, Methodists, acting for the Trustees of the Wesleyan Methodist Church, bought most of the land known later as the ‘Parish Centre’ but were loath to build a denominational building whilst the district was cooperating so well. But in a wonderful act of faith and only three weeks after making the decision to build, the present building was erected in one day on, 4 September, 1915, and at a debt-free cost of £400. The building and surrounds were completed to fences, gates, painting, furnishing etc. and at the height of the day’s activity, 100 mainly tradesmen were hard at per-determined tasks, backed-up by those providing drinks and meals. The foundation stone was laid at 3 pm and the latch on the gate put in place just before the Sabbath late on that momentous Saturday. In turn, Presbyterians, Anglicans, Roman Catholics, and Salvation Army followers built their cause from the Methodist Mission Hall, and moved to their own or larger buildings from the late 1950’s on. The undenominational Sunday school disappeared shortly after St Barnabas Church was opened. About 1960 the Methodist Trustees bought a 1/5 acre section next to the Church property from Mr Bentley for £920. This property, lot 1 DP 49056, was the subject of an attempted takeover by the Waitemata County Council in early 1970, and according to correspondence held, the Council threatened to acquire the land by use of the Public Works Act. However, after considerable protest the Council withdrew its intention and built its Library and parking area further down the road. Prior to this, in August 1964, the architect Mr. K.C. Grant had sought and obtained permission from the County, after submitting a site development plan, for the Methodists to build a Church to seat 450, an attached Hall with accommodation for 200, Sunday School rooms, kitchen, lounge, toilet areas, etc. There was also provision for 80 parking spaces, and whilst the new buildings were being erected the old Mission Hall would have not been affected. When subsequently removed the area vacated was to become a courtyard. This gives an indication of the size of the present land, remembering that about 15ft of the Glenfield Road frontage plus a slice of the Bentley Avenue/Glenfield Road corner was to be taken without compensation by the County for street widening. Sadly, the Methodist authorities pulled back from the project and whilst those who had to make that decision may have lacked the faith of their 1915 forebears, the building continued to be used widely by the community – Alcoholics Anonymous, Weight Watchers, Women’s Institute, political and youth groups etc. -and this attitude continued without interruption even when the Methodists combined with the Anglicans in 1974. A sub-committee of the Methodist Trust, usually one person like Bob Overend, managed the Church and its environs, letting, cleaning, organising working bees, repairing until the Centre Committee, which was initiated and structured by the Cooperating Parish, was put in place later the 1970’s. The Methodist parsonage site, 1 Chivalry Road, was purchased in July 1964 at a cost £1,500 by the Birkenhead Methodist Trustees. The house was later erected in 1975 at a cost in excess of $40,000. Mr Noel Souster, who tendered for the construction, was a son of Marmaduke Souster who planned and provided 30 of his men for that wonderful day in September 1915. The title for 1 Chivalry Road was transferred to the Board of Administration of the Methodist Church of NZ in November 1980. The parsonage was occupied periodically by Methodist ministers until John Salmon, appointed in 1977 left the parish in 1982, when it was leased until the property was sold in 1995. Transcribed from an original undated document of unknown authorship held in church records. Last paragraph added September 2008.